Ay, Fan Bearer, about 1360 B.C. 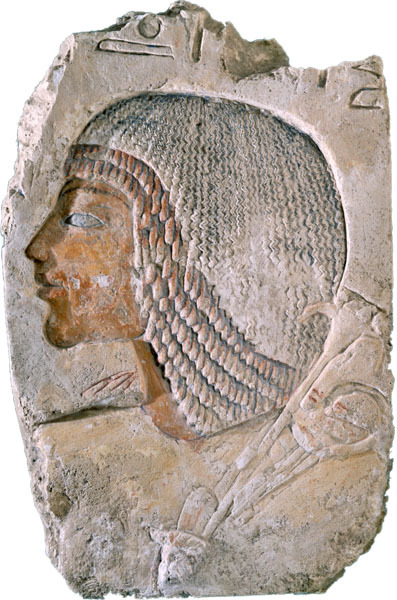 Ay was a favored courtier of the pharaoh Akhnaten and vizier under his successor Tutankhamun. Here Ay is depicted as a powerful royal advisor, holding the fan, crook, and scarf that symbolize his fidelity to the king. His flesh is colored a reddish brown, typical of males in Egyptian art. Succeeding Tutankhamun, who died prematurely, by marrying the boy king's widow, Ankhesenamun, his own granddaughter, Ay died after a brief rule of four or five years. This fragment, carved in sunken relief, comes from a wall in his tomb at Tell el Amarna on the on the eastern bank of the Nile. In its entirety the relief showed him kneeling in worship with his family and surrounded by a long prayer inscribed in hieroglyphics. The style of Ay's portrait is typical of the Amarna period in its naturalistic depiction of the narrow and bony face, long nose, and small, squinty eyes- features common to other surviving representations of him.